Serve almost any menu item in a stylish food serving basket. Whether it’s fish and chips in a red plastic basket, crispy french fries in a wire cone basket, or artisan breads in a chic metal basket, these food serving baskets will compliment your décor as well as your food. From the bagel shop, to the office break room, to an elegant party buffet, baskets provide a simple, attractive way to display a variety of menu items. Candles are that extra-special touch that increases visual appeal in the dining room. Set the mood with a simple modern table light, a romantic candle and holder, or a dramatic array of candles that make a statement. Choose from taper candles, votives, oil lamps, lamps with globes/shades, tea lights, and flameless candles. Serve water, beer, tea, or juice in a convenient pitcher. Choose from clear or amber shatter-resistant plastic. Designed with a sturdy handle, in small and large size, these pitchers help servers to quickly refill customer beverages, or leave the pitcher at the table for customer self-service. These pitchers are also ideal for serving juice and soft drinks at a buffet beverage station. For a little added flair, a carafe can be an elegant way to present juice as well as wine. Squeeze bottles aren't just for the kitchen anymore. Colorful, easy to use squeeze bottles give customers and easy way to dispense condiments like ketchup, mustard, and barbecue sauce. Set them together in a self-service area, or place them on tabletops for ultimate convenience. For hot or thick liquids, a syrup pourer can get the job done. Plastic dinnerware provides a plethora of patterns, shapes, and styles. You can opt for all the pieces in a single collection or mix and match pieces to create a unique presentation. A durable alternative to china, melamine tableware is resistant to shattering and breaking, making it an ideal option for any outdoor restaurant or dining establishment. Whether you’re looking for tableware or displayware for the buffet, melamine fits the bill. Whether a single menu card or a multi-page menu book, the right menu cover can make a big impact. Choose from tall and slender for wine and cocktail menus, oversized menu boards for fine dining menus that change daily, pocket size covers for dessert menus, and many more options. From clear plastic covers for casual dining, to high-end bound leather menu covers, we’ve got what you need. In Italian restaurants, pizza parlors, and sandwich shops cheese shakers are a given. Provide guests an convenient way to season their pasta, pizza, sandwich, soup, and more with an attractive cheese/spice shaker. Available with glass or plastic bodies, these shakers feature a perforated, stainless steel, screw top for easy filling and dispensing. Stainless steel dredge/shakers are perfect for finishing dishes before they leave the kitchen. A little spice on top of savory soups or pasta dishes, or perhaps a little powdered sugar on French toast at breakfast. Select the size and style that works best for your needs. 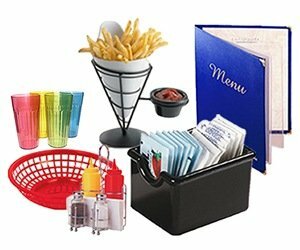 Save time and money by providing bulk sugar to guests in easy-dispensing sugar pourers. Perfect for diners, coffee shops, cafeterias, and office break rooms, these sugar dispensers have twist off caps for easy refills. Eliminate the mess of empty sugar packets with a convenient sugar pourer.